Dr. Craig Mehlhoff is a native of Aberdeen. He received his Bachelor degree at the University of Washington in 1976 before pursuing his professional degree at Southern California College of Optometry where he graduated in 1980. Immediately after graduation, he returned to Aberdeen to join practice with Dr. Fred Berken and Dr. Thomas Berken. 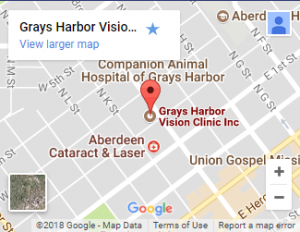 After the retirement of Fred and Thomas Berken in the mid 80’s, Dr. Scott Berken, (Tom’s son) joined partnership with Dr. Mehlhoff to become Grays Harbor Vision Clinic. Dr. Mehlhoff has been active in the Grays Harbor community. He is a member of Aberdeen Rotary, Elks, Chamber of Commerce, and he has been extensively involved with many other civic organizations. He loves the performing arts, and has been a professional musician and vocalist on many stages across the Harbor. Dr. Mehlhoff has served the profession of Optometry on local, statewide, and national levels. He was President of the Optometric Physicians of Washington (OPW) in 1995, and has served in leadership for the American Optometric Association (AOA). Craig was honored to receive the OPW “Young Doctor of the Year” Award in 1990, and later, the “Doctor of the Year Award” in 2006. Craig married his Aberdeen High School sweetheart Pamela (Ingram) in 1976. They have two children, Evan and Renzel, who are currently students at Grays Harbor College. As a family, the Mehlhoff’s enjoy live music and the other performance arts, where they can be seen both on and off stage.